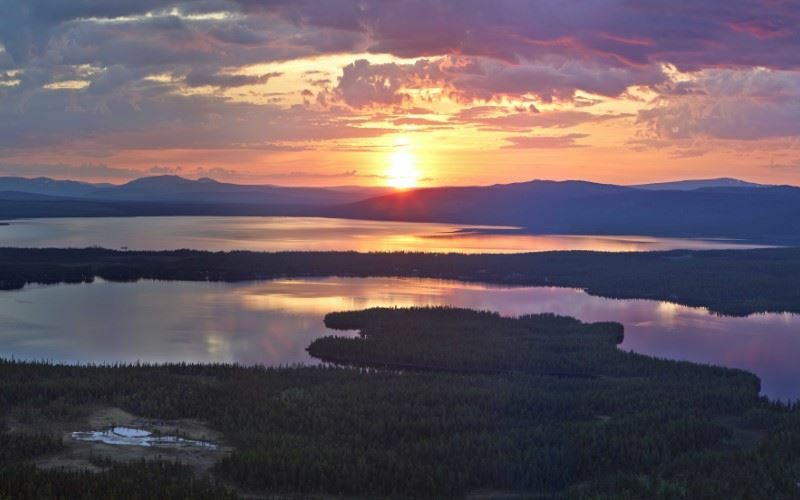 As the permanent glow of the Midnight Sun gives way to the glorious golden hues of autumn Swedish Lapland comes into its own. For many, this is the best season of the year and the most beautiful: the forests explode with colour, wild fare is ripe for picking and, as the days get shorter, spectacles of the billowing waves of the Aurora Borealis can be seen. Autumn has another appeal and that is it offers the perfect conditions for a wealth of outdoor experiences. From hiking and biking to fishing, foraging, wilderness dinners, swimming and boat tours there is much to sample and enjoy. On arrival at Luleå airport, you will be transferred to Brändön Lodge on the shores of the Bay of Bothnia. Overnight and evening meal at Brändön Lodge in Brändön. The wide and grippy tyres on fat bikes allows you to cycle out into the wilderness, along forest trails and over sand, mud and even snow. With a local guide, today you will explore the village of Brändön and its surrounding forests and archipelago. Allow the calm of your surroundings to envelop you and open your senses to the sights, sounds and smells of the nature. Leisurely afternoon and lunch at Brändön Lodge before joining an evening boat tour on the Baltic Sea. As darkness sets-in you will land on one of Luleå’s low-lying islands and make camp. A roaring fire will be lit whilst your local guide prepares a fantastic outdoor dinner, and all you need to do is to sit back and relax. If conditions are right this remote spot, away from all artificial lights, will offer you front row seats for watching the Northern Lights dance on the cosmic winds above. Overnight at Brändön Lodge in Brändön. The forests around Brändön are full of autumn delicacies including blue berries, cloud berries, lingon berries and a variety of mushrooms including chanterelles and porcini. These local ingredients are an integral part of many traditional dishes as well as in health and beauty products. Today, your guide will take you for a stroll in the forest and will teach you about the local flora and fauna. You will pick berries and mushrooms, some of which will later be used in the three course outdoor dinner that you prepare alongside Brändön’s chef. Lunch and overnight at Brändön Lodge in Brändön. Day at leisure at Brändön Lodge or opportunity to participate in a guided kayak tour, a yoga experience, a seal safari by boat and to learn Nordic wilderness skills (pre-bookable through Sunvil). Lunch, evening meal and overnight at Brändön Lodge in Brändön. After breakfast, you will be transferred to Luleå airport for your return flight to the UK. A jewel in the crown of Swedish Lapland, Brandon Lodge is everything a winter retreat should be. Not only does, this locally owned and managed property enjoy an idyllic setting on the shores of the Bothnian Bay, but it is also an outstanding activity centre and one of the most welcoming and relaxing accommodations we have visited. At the heart of the property is a two story lodge where guests can sit beside the roaring fire to read or discuss their adventures. Host, and part-owner, Goran and his team are never far away and always willing to share their stories about life in the sub-Arctic. Upstairs in the lodge is a restaurant serving wholesome local dishes; the smell of afternoon freshly made waffles often fills the lodge. Surrounding the lodge are 15 detached wooden cabins, each with two bedrooms. These units are ideal for families or for couples wishing for a space of their own. Winter activities including snowmobile, dog sled and reindeer sled tours are available, but these are just the start. We would also recommend the winter skills experience which teaches you the survival skills required for an Arctic winter and how to build a fire in the snow and the hovercraft tour over the frozen Bothnian Sea during which seals, sea eagles and reindeer are often spotted. 15 cabins each with two twin bedrooms, bathroom (shower and hairdryer), lounge, kitchenette (four electric hobs, microwave, kettle and fridge) and view towards the bay.